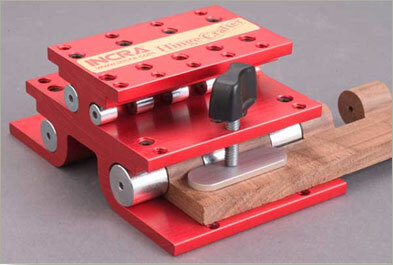 Heard a rumour recently (actually more than a rumour – if it happens to be dropped into conversation by Professional Woodworkers Supplies, then it is a fait accompli), that along with the recent release by Incra of their top-line products with a metric version, the HingeCrafter is also going to have a metric version. 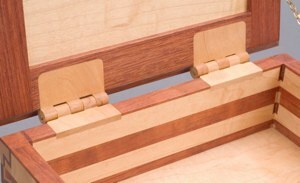 The only holdup now for it to make the market, is waiting for the metric Whiteside router bits to be developed. 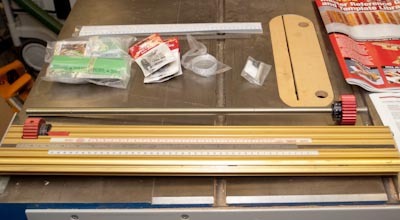 So good news for those who want, or have a metric Incra LS Positioner, and want to be be able to use it in conjunction with the HingeCrafter to make a stylish wooden hinges for their project. The hinges can then be made in the same timber as the project (or contrasting as a feature), and really look to lift a project to another level. Imagine getting a stylish dovetailed box with a hinged lid, and how it would look if the hinges were brass compared with wood. The whole project goes from “wow”, to “WOW”. Contrary to what you might expect, the HingeCrafter is not actually used to form the hinge knuckles. 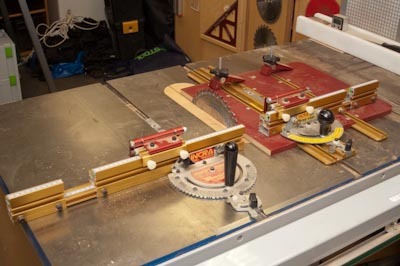 That is achieved on the router table, with the Whiteside router bits and the LS Positioner. The HingeCrafter is used to bore the hole for the hinge pin. 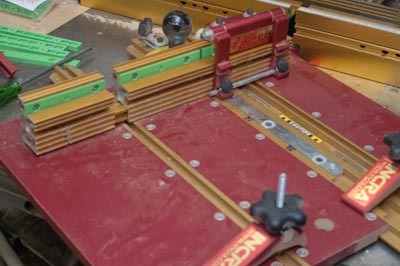 It is both important that the hinge pin is perfectly straight (so the hinge operates smoothly without binding), and that no breakout occurs as the hole is being drilled (let alone having too much side pressure causing weaker timbers to have knuckles break off altogether). With the included drill bit (and assuming the metric will be the same as the imperial), hinges over 10″ long are possible (254mm in metric). Any sizes you want (length of bit depending – the hinge can be up to twice as long as the available bit), and 4 different diameter hinges. Made in your timber of choice, either matching the project, contrasting with it, or both! And no more of those brass screws who’s heads seen designed to shear and pop off at a moment’s notice. A little while ago I mentioned that Incra now has metric versions of the LS Positioner – something I was not expecting would actually ever exist, but now does! 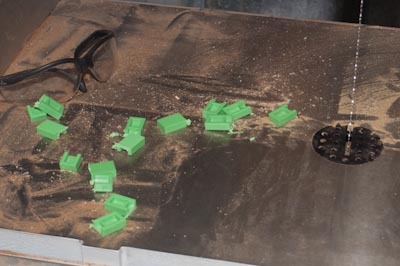 The big resistance has always been that router bits, and in particular dovetail bits were imperial and therefore would be incompatible with a metric positioner. In an arrangement between Incra and Whiteside, metric dovetail bits are now available, paving the way for the metric LS positioner. 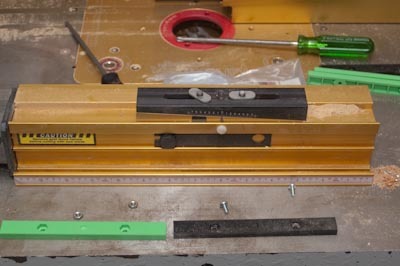 Because I really wanted the LS positioner, and metric wasn’t an option, I was always prepared to work in imperial when necessary, when using the router table (and kept the other Incra tools imperial as well), but in all fairness, I just cannot think in imperial – my brain just doesn’t swing that way. So I am really excited to finally be able to convert fully to metric – it is going to make such a difference. There isn’t a great deal to the conversion kit – the primary item is obviously the lead screw, and there is no question the quality of the metric version is definitely to the same standard as the original. In addition to the leadscrew, there are a number of the plastic positioners for the various fences and stops. Starting with the positioner, it is surprisingly easy to change over. The end of the positioner is removed, the thrust bearing removed (an interesting arrangement of a cup and large bearing), and a couple of plastic rods withdrawn. The lead screw is then easily pulled out, and the new metric one dropped in. The process is then reversed – this step taking only a few minutes. The rules on top are replaced, although curiously there is no metric version of the centring rule. Wonder if that is an omission? Clicking through the microadjustment, and it is no longer 1/1000th of an inch, it is now 0.05mm per click (2/1000th”), however it is easy to see when you are half-way between clicks, so it means the accuracy is equivalent. 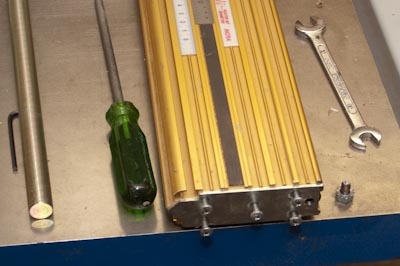 Next, the base is taken apart, with a new threaded bar and different shims. Once that was reassembled, I tried out the positioner, and it was ok, but I found it too tight. Taking out a couple of shims, and we were good to go. A few tests and it was all running smoothly. I then changed over all the fences and stops, but instead of ignoring that the bars are often longer than the original equipment, I took them to the bandsaw then disk sander to get the length down. This was very effective, and from the other photos you can see both lengths in use. Cutting down the v Groove was very easy – firstly on the bandsaw, then down to sand them on a disk sander. 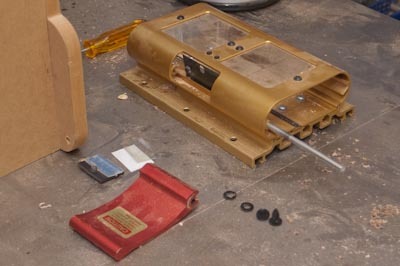 The plastic is thermoplastic, so it melts with the friction of both the bandsaw and the sander. That made it even easier to cut down the bars and clean them up. So the upgrade is done, and I’m looking forward to use then to see what it is like now to use. 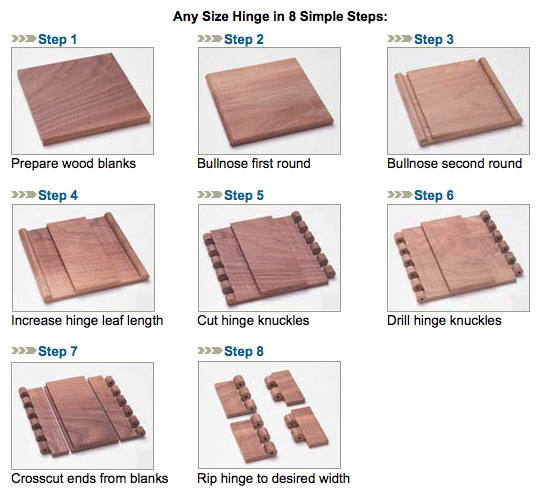 This upgrade is only available from Professional Woodworkers Supplies. Limiting your range of plans? As much as I do enjoy coming up with my own designs and projects, building them in my mind, working through the specifics of design, I also look at a LOT of woodworking plans. I’ve gotten to the point that I don’t necessarily care whether the plan is in imperial or metric, but I do know a lot of people who are only comfortable working with plans that use the same measurement scale that is ‘native’ to their country, and as such pass up on the opportunity to use some incredible designs just because they are drawn up in inches and not millimetres (or the reverse). At times, it really does become necessary to work in one, or the other, or worse, mix the two in the same project. In Australia for example, being metric and mm being our forte, we run into a constant problem that often not only are the plans in imperial, but so are the tools! Router bits are imperial, that is just a fact. Often the same with other cutters, such as dado blades etc. So what do we do? Abandon projects that require a conversion? Constantly get out a calculator and divide the fraction then multiply by 25.4? Or just use a better calculator. The FastCap Converter Pro, from Professional Woodworkers Supplies allows calculations in digital imperial, fraction, and metric all in the same calculation and then have the answer in metric or a fraction (and flick between the two). So if you wanted to add 2.52″ + 2 5/32 +37.5mm you can. Easily. Or subtract the kerf of your blade, measured using a digital caliper. Or whatever. The point is, you don’t have to ignore projects, plans, tools that use a measuring system you are not confident with. And that is the advantage that having the Converter Pro in your pocket gives you.